In July 2013, my team and I at QCRI launched this dashboard to analyze hashtags used by Twitter users during crises. Our first case study, which is available here, focused on Hurricane Sandy. Since then, both the UN and Greenpeace have also made use of the dashboard to analyze crisis tweets. We just uploaded 700,000+ Westgate related tweets to the dashboard. The results are available here and also displayed above. 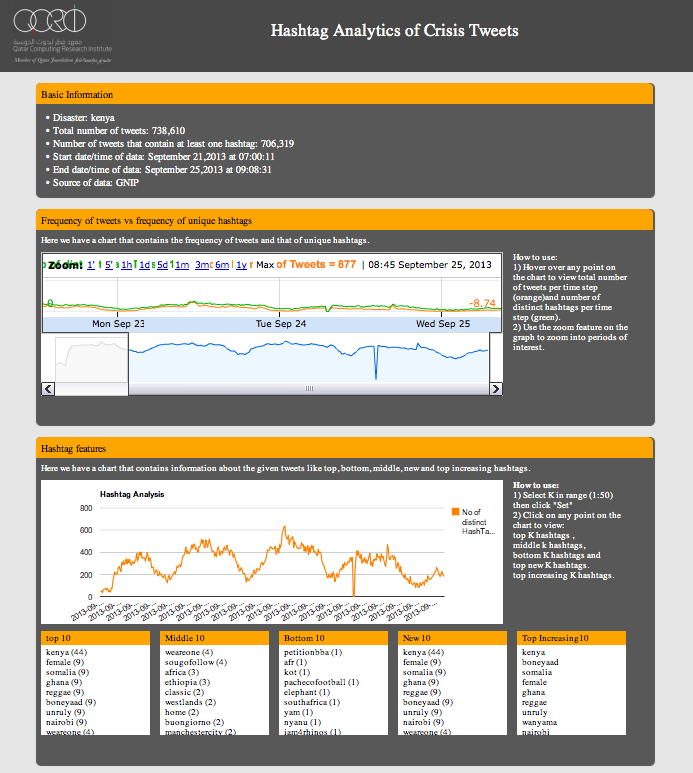 The dashboard is still under development, so we very much welcome feedback on how to improve it for future analysis. You can upload your own tweets to the dashboard if you’d like to test drive the platform. Update 1: Our original Twitter collection of Westgate-related tweets included the following hashtags: #Kenya, #Nairobi #WestgateAttack, #WestagateMall, #WestgatemallAttack, #Westgateshootout & #Westgate. While we overlooked #Westlands and Westlands, we have just fixed the oversight. This explains why the original results below differed from the iHub’s analysis which was based on tweets with the keywords Westgate and Westlands. Update 2: The list below of first tweets to report the attack has been updated to include tweets referring to Westlands. These are denoted by an asterisk (*). I’m carrying out some preliminary “information forensics” research on the 740,000+ tweets posted during the Westgate attack. More specifically, I’m looking for any clues in the hours leading up to the attack that may reveal something out of the ordinary prior to the siege. Other questions I’m hoping to answer: Were any tweets posted during the crisis actionable? Did they add situational awareness? What kind of multimedia content was shared? Which tweets were posted by eyewitnesses? Were any tweets posted by the attackers or their supporters? If so, did these carry tactical information? If you have additional suggestions on what else to search for, please feel free to post them in the comments section below, thank you very much. I’ll be working with QCRI research assistants over the next few weeks to dive deeper into the first 24 hours of the attack as reported on Twitter. This research would not be possible where it not for my colleagues at GNIP who very kindly granted me access their platform to download all the tweets. I’ve just reviewed the first hour of tweets (which proved to be highly emotional, as expected). Below are the very first tweets posted about the attack. gun shots in westlands? wtf?? Something really bad goin on at #Westgate. Gunshots!!!! Everyone’s fled. As part of QCRI’s Artificial Intelligence for Monitoring Elections (AIME) project, I liaised with Kaggle to work with a top notch Data Scientist to carry out a proof of concept study. As I’ve blogged in the past, crowdsourced election monitoring projects are starting to generate “Big Data” which cannot be managed or analyzed manually in real-time. Using the crowdsourced election reporting data recently collected by Uchaguzi during Kenya’s elections, we therefore set out to assess whether one could use machine learning to automatically tag user-generated reports according to topic, such as election-violence. The purpose of this post is to share the preliminary results from this innovative study, which we believe is the first of it’s kind. The aim of this initial proof-of-concept study was to create a model to classify short messages (crowdsourced election reports) into several predetermined categories. The classification models were developed by applying a machine learning technique called gradient boosting on word features extracted from the text of the election reports along with their titles. Unigrams, bigrams and the number of words in the text and title were considered in the model development. The tf-idf weighting function was used following internal validation of the model. The results depicted above confirm that classifiers can be developed to automatically classify short election observation reports crowdsourced from the public. The classification was generated by 10-fold cross validation. Our classifier is able to correctly predict whether a report is related to violence with an accuracy of 91%, for example. We can also accurately predict 89% of reports that relate to “Voter Issues” such as registration issues and reports that indicate positive events, “Fine” (86%). The plan for this Summer and Fall is to replicate this work for other crowdsourced election datasets from Ghana, Liberia, Nigeria and Uganda. We hope the insights gained from this additional research will reveal which classifiers and/or “super classifiers” are portable across certain countries and election types. 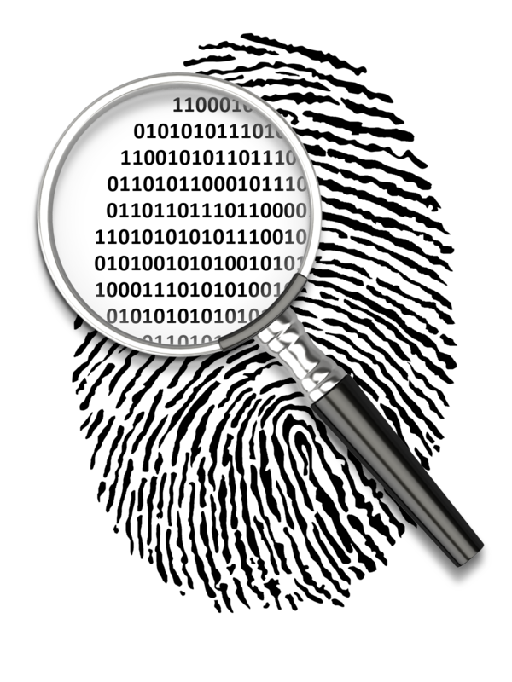 Our hypothesis, based on related crisis computing research, is that classifiers for certain types of events will be highly portable. However, we also hypothesize that the application of most classifiers across countries will result in lower accuracy scores. To this end, our Artificial Intelligence for Monitoring Elections platform will allow election monitoring organizations (end users) to create their own classifiers on the fly and thus meet their own information needs. Big thanks to Nao for his excellent work on this predictive modeling project. In sum, “despite SMS outages, phone loss, and a rural population, these results suggest that simple SMS interventions could be an important strategy to sustaining optimal ART response.” In other words, SMS reminders can serve as an important tool to catalyze positive behavior change in resource-limited settings. Several insights from this study are going to be important for us to consider in our PeaceTXT project. So if you know of any other relevant studies we should be paying attention to, then please let us know. Thank you! At PeaceTXT, we’re taking a very similar approach to SMS messaging. 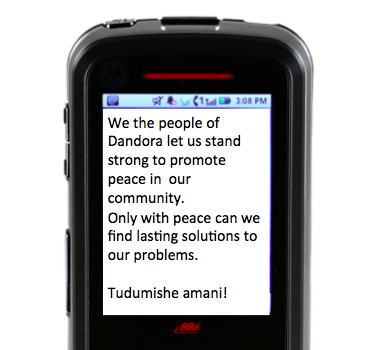 In our case, we are developing an SMS Library specifically for the purposes of changing recipients’ behaviors and perceptions vis-a-vis peace and conflict issues in Kenya. This shift towards a culture of preparedness is really important, both for disaster response and conflict prevention. We are currently organizing a series of focus groups with local communities to develop the content of our SMS Library. We plan to review this content in August for inclusion in the library. I very much look forward to scheduling a conference call between InfoAsAid and PeaceTXT in the coming months to share lessons learned thus far in the development of our respective message libraries. For more on InfoAsAid’s absolutely critical resource, this short video provides a very good summary, including how sensitive messages are managed and how you can contribute SMS content to this very important service. Some serious thanks and praise are in order for InfoAsAid’s work. 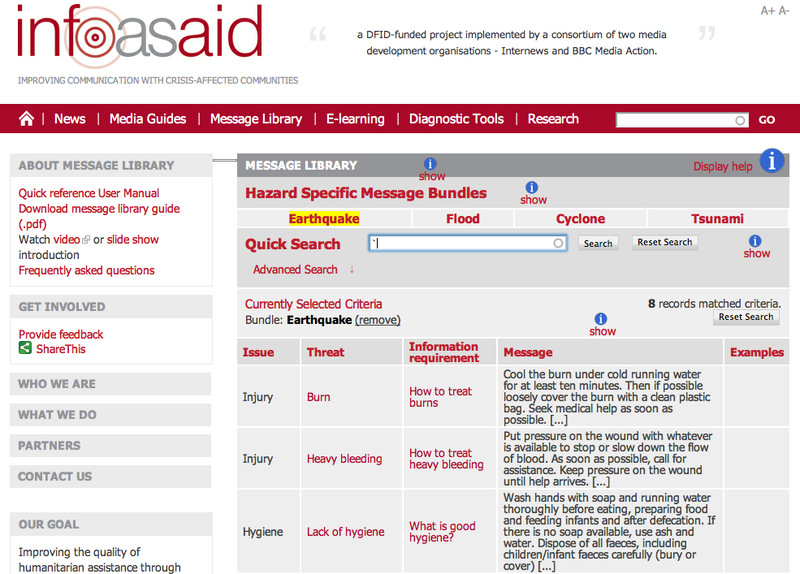 I do hope that the team at InfoAsAid will join us at the International Crisis Mappers Conference (ICCM 2012) to share the latest on their excellent initiatives.